﻿ Outrigger Koh Samui Beach Resort (Thailand) | FROM $130 - SAVE ON AGODA! 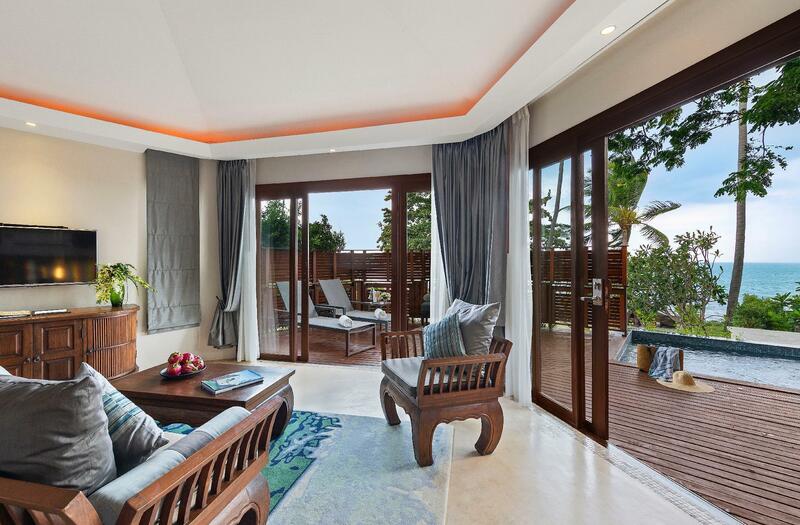 "Excellent resort and quiet The staff all are excellent in ev..."
Have a question for Outrigger Koh Samui Beach Resort? "Perfect place & perfect work!" "I had a wonderful vacation here." 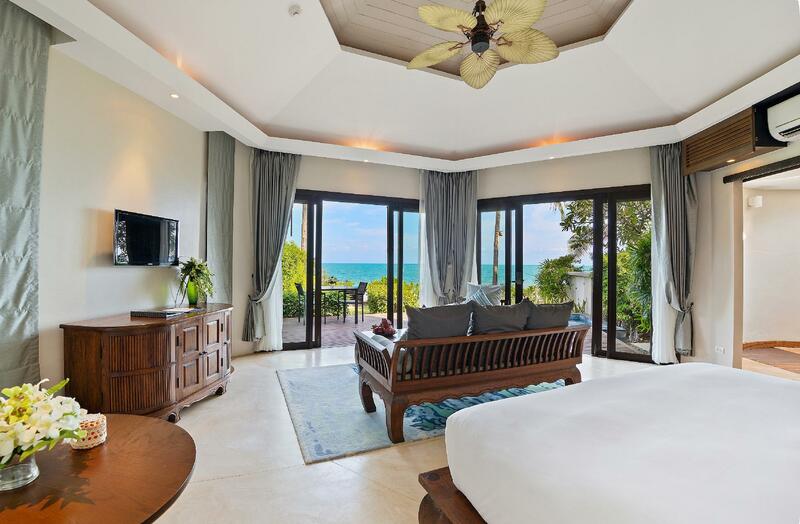 "Pros - loved the pool villa-great size pool, lovely decor;"
Outrigger Koh Samui Beach Resort is a tropical beachfront resort located on a secluded 300-meter stretch of beach, overlooking the tranquil clear waters of Hanuman Bay in Koh Samui. Spectacular granite headlands and swaying palms create an atmosphere where you can find true relaxation and romantic getaway. 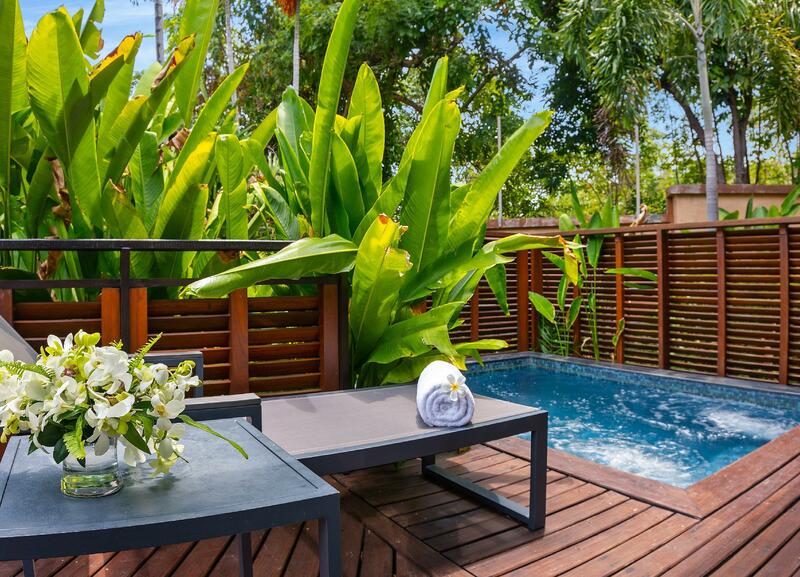 Choose from unique Plunge Pool Suites with private sun deck to 1-Bedroom Pool Villas with spacious swimming pool. Two swimming pools and a kids’ pool are just right on the beach. A selection of restaurants and bars, Thai cooking school, the lavish Navasana Spa, and water activities will satisfy every sense and inspire romance. Getting around Koh Samui is also convenient. 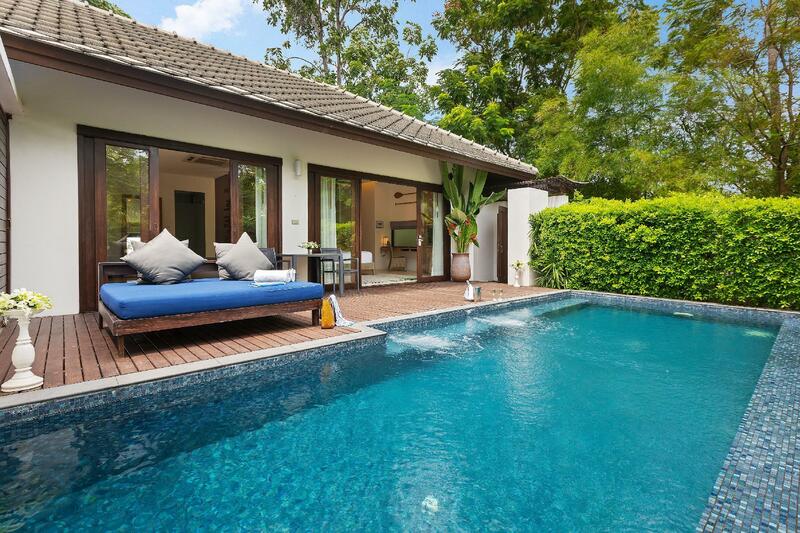 It’s just ten minutes from Samui International Airport and approximately seven minutes from Chaweng Beach to the south. To the north is Cheong Mon Beach which is four minutes away. 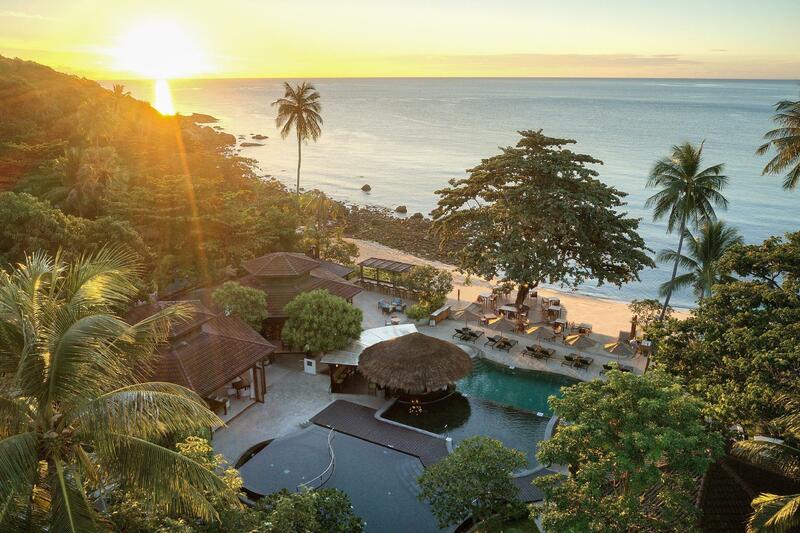 "We enjoyed our stay here and would like to thank Outrigger s..."
Stunning location, eco friendly hotel considerate in preserving its pristine surroundings, yet provides fantastic facilities. Staff are extremely friendly and helpful. Best beach holiday i've had in years. It's a very beautiful hotel but there are a few downsides that make it a bit less spectacular: the bungalows are very thin so you hear all the noise from outside, the beach isn't very swimable, there are rocks and oil in the water and the location is rather far outside. For that I think they charge too much per night. Stayed here for 4 nights on our first leg of the trip in Koh Samui. Upon arrival, the hotel was able to give us early check-in but unfortunately, there was toilet problem in our suite. Once they resolved the toilet issue, then it's the bathroom flooding issue... in which the receptionist, Ms Pui, managed to move us to another room at night time and it completely resolved our toilet problems. We enjoyed our stay here and would like to thank Outrigger staffs for making our stay memorable. There was one beach staff who was very helpful when our son fell on the beach rock and his knee was bleeding. He quickly grabbed the first-aid kid and administered it to our son. We are very appreciative for his help as well. Though the location is a bit inwards, for travelers who would like to save a bit of money, you can easily rent bike or car from the outside hotel small store - Power B travel - and it has laundry service as well. We definitely would not hesitate to come back if we happen to visit Koh Samui again. I had a wonderful vacation here. The hotel has clean beach, comfortable room, and good service. One of the most favorite activity in the resort is having breakfast. The restaurant provides various dishes made by your order instead of only butffet. I hope i will go to the hotel again. Lovely beach holiday, but what made the place stand out was the ever so amiling and helpful staff, especially Bao, Amm and Nong. Many many thanks for their hospitality, energy especially from Bao and helpfulness. We are always in gratitude to their help! We had a wonderful stay. Rooms were big & comfortable, not much storage for 2 people. The staff were fantastic. Cocktails were great. Breakfast was really nice and the selection was made fresh to order everyday. We enjoyed the pool, although not many sun loungers are available. The spa was a nice treat although a little over priced, we use a 50% off voucher that was given in our welcome pack. The hotel manager is often seen during the day checking on staff & guest and was always friendly and approachable. Overall our stay was fantastic and Akaryn warrants its 5 star rating. We will be back again. Relaxing, comfortable and service 5star! I had booked a number of rooms at the Akaryn for my wedding guest. 10 in total. The staff were always on had to help and did so with genuine smiles. The steak house served up excellent steak although the sides were a little disappointing. We ate most of our meals at the sea dance next door as they served a tasty curry! I was a little disappointment with the selection on the room service menu, no deserts and a limited selection. Breakfast was really good and they serve a great cocktail. Overall everyone enjoyed thier stay at the Akaryn and Looked forwarded to returning when in Koh samui. Location was perfect we wanted to be outside of the husle busle of chaweng and as most of our guest hired scooters, they were less than 10 mins away. Great hotel, a must stay highly recommended. The rooms are very spacious with a lot of privacy, the quality of service from all staff is really excellent, the breakfast buffet is very nice. The Akaryn is a very nice resort for a romantic getaway. We stayed in a 'Pool Suite', which was a little bit deceptive, since the 'pool' is this case is just a large jacuzzi. The room was spacious, clean, with very nice bathroom, and a lot of privacy. The pool is very nice, at multiple levels, and the private beach is nice and clean (not suitable for small children, as the drop-off is quite steep). The quality of the service from all staff was really excellent. As part of our stay, we enjoyed the New Year Eve party, although I would say that at THB 6,300 per person it was over-priced (only a welcome drink, average buffet, the band was not very good, although the fireworks were very nice). In general, I feel that (for Thailand) the hotel is overcharging for food and drinks. My husband n i had a great stay in this resort and we were very impressed with the setting, atmosphere and the food served at The Edge restaurant. The staffs are well trained and we were invited to their cocktail party upon arrival. Good hotel and great team --- we had good time at Akaryn n would recommend this hotel to those who wish to stay away from crowd !! Great place to stay if you want a quiet getaway from the main beaches of Koh samui.Has its own private beach to swim in.Main Pools also a good size. The staff are very friendly and helpful. One of the best breakfasts that we had on our two week tour of Thailand. Welcomed by a lovely receptionist with tea and warm towels. Stayed for 4 nights in the pool villa. Love the day bed and the jacuzzi. When u wake up in the morning, u could hear birds chirping. Everything has the spa ambience. I went for the complimentary yoga class with Dr. Serge. Thumbs up! Had romantic dinner by the beach too. U could kayak, swim at the beach or just read a book at the library near the beach :) absolutely love everything about Akaryn! excellent, good food. The room was was good although took a few days to clean the pool next to room. The staff were helpful and very attentive, althiugh i found the price of drinks expensive compared to other resorts of the same standard. The whole experience was enjoyable and would return in the future . I stayed 4 days in this hotel and I really enjoyed my staying there. Everything in the hotel is perfect for us as I was staying in the pool Villa. Room is huge . Although the swimming pool is not very big, but I think it is even nicer than the public swimming pool.However, you can see people from outside as the fence is not high enough for privacy. The public swimming pool is very small indeed. Restaurant is by the sea and he food was delicious. We like the breakfast very much as you can order from the menue as much as you like. It is a bit far from the city center, but for those who really want a quiet place for relaxing, Im sure Akaryn is the best place for them. The hotel is 10mins away from the airport. Shuttle is provided twice a day by the hotel to Chaweng, the ride isn’t that Long as well, probably a 15mins max drive. The villa is good, pool jet is working fine. Aircon and water works are all working well. Breakfast spread is good. View from the restaurant is nice. Staff are very friendly and helpful. There is a 7-eleven at the main road, which is a 5mins walk out but I’ll recommend gg out in the day. It’s quite dark in the night. Do note there’s mosquitoes as well. We really wanted to love this place, but there are certain shortcomings that knocked off a few points for us. Firstly, the cicadas really are very, very loud. That's no fault of the hotel and it's authentically natural, that's for sure, but it does grate the nerves a bit and that's kind of not the point of a vacation. Secondly, the staff are really wonderful and professional, but the hotel has been through three owners the last 10 years and Outrigger took over in 2015 and needs to re-invest to make it a true five star facilities hotel (gym equipment not working properly for example), though the showers and AC work great and if there ever was a problem, the staff attended to it right away. They really deserve a property that reflects their professionalism and level of service. Finally, the bleach is nice to look at, but the waters are not as calm as in Bophut or the sand as fine as Chaweng, so you really need a completely calm weather day to swim. It's also a bit far from "happenings". Staff customer service, a hallmark of a good hotel, needs to be improved. Staff is inflexible, unfriendly and not very courteous to guests. In terms of cleanliness, while we understand there’s bound to be leaves falling into the pool because of the verdant environment, staff should be aware and clean external villa area regularly. We were not able to use the plunge pool because of all the leaves.